IF YOU CAN’T HIT WHAT YOU SHOOT AT, WHAT’S THE POINT OF HAVING A GUN? You own a handgun to hit what you shoot at, right? Whether it’s defending yourself and loved ones, sporting competitions, or just target practice, an accurate and easily-seen sight will help you hit your target. What if there were a sight that could help you get faster, more accurate hits-even when you’re staring at the target and are not focused on your gun’s sights? Precision hits under stress. That's the SureSight advantage. A more intuitive design. Easier to user and faster under stress compared to standard sights. SureSight can give you the confidence you need to make critical hits when it matters most. SureSight uses scientific principles to help your brain align the sights QUICKLY, and with less effort. Even under stress. If your sight ever breaks, we’ll replace it, period! SureSight aligns quickly! The front sight is visually “stacked” on top of the rear sight, and the resulting alignment forms a triangle. The tip of the triangle becomes the point of impact. This allows you to SIMULTANEOUSLY see much more front sight and more of the target. SureSight is aimed by aligning the front and rear sights so that they form a triangle. Once aligned, SureSight exposes more of the target than conventional sights, while still providing an easier-to-see front sight, as can be seen in a properly aligned SureSight in the photo on the left. In the overlay on the right, you can see how SureSight simultaneously allows for increased sight visiblity AND increased target visiblity, versus notch & post sights. If this man was trying to kill you, where would you be looking, at your front sight, or at HIM? SureSight’s unique shape and color allow you to stare at the threat and still pick up a sight picture. Note how the SureSight still gives a sight picture, while standard “3-Dot” notch and post sights are much harder to see while focused on a threat. Accuracy is usually better and quicker if the main focus of the eye is on the front sight. Under pressure, however, stress can typically prevent the ability to focus on the front sight. Our larger and “involuntarily seen” sight delivers good, repeatable hits on a man-sized target out to 7-10 yards, even if the shooter’s focus is intently on the target. The front sight’s fluorescent yellow color and distinctive shape facilitate this by making the sight easily seen, even when your eye is not deliberately focused upon it. SureSight’s front sight is always visible Because of our front sight’s large size and the rear sight’s relatively small size, the front sight can never get “lost” in rapid aiming behind the rear sight. A common problem with traditional notch & post sights. Because of the unique configuration and shape of the SureSight, the size ratio between the larger front and smaller rear sights do more than just aid in faster target acquisition. This advantage also makes shooting multiple targets, shooting on the move, and regaining sight picture after recoil much simpler. Because of SureSight’s innovative shape, the front sight is always visible, and can never get “lost” behind the rear sight, as can be seen in the above photo. On the other hand, this post front sight is about to become completely hidden behind the rear sight with just a tiny bit more rightward movement. Photos are deliberately focused on the front sight, and blurred on the rear, to simulate vision while shooting. SureSight makes aiming more intuitive and easier to use under stress. SureSight’s distinctive triangular shape capitalizes on an inborn skill all humans possess called “closure”, one of the “Gestalt Principles of Perceptual Organization”. This means that all humans are born with the ability to complete shapes. Since we are all born with this ability, our new sight makes aiming more intuitive. And science substantiates that if an action can be performed intuitively, it will be more easily performed under stress. According to the Gestalt Principle of “Closure”, we tend to see complete shapes even when part of the information is missing. Your mind completes the triangle in the figure above on the left even though the “triangle” is really three incomplete circles arranged a certain way. You can clearly see a circle in the figure in the center, can’t you? Even though it is just a series of smaller circles, the brain fills in the missing information. And despite the fact that there aren’t any triangles or circles in the shape on the right, your mind is able to fill in the missing information to create those shapes. When the information is incomplete, your mind automatically fills in the shape. People tend to open up both eyes involuntarily under stress, without using one eye and focusing on the front sight. Under extreme stress, the eyes often become physically incapable of focusing at near objects, such as the front sight. 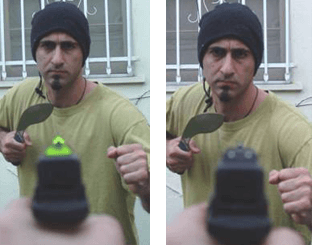 This survival mechanism causes the eye muscles involuntarily to focus at a distant threat, rather than focuson a gun's sights. "Tunnel vision", whereby stress normally decreases peripheral vision by up to 70%. In this case, even when distracted by an immediate danger, your mind instinctively forms the sight triangle and acquires the target without requiring conscious thought. The simpler, more intuitive and more automatic aiming is, the more effectively (and quickly) it can be done. The larger and brighter the front sight, the greater the chances of it being seen, even with your eyes intently and involuntarily focused on a distant threat. Since the front sight is far more critical to both pinpoint accuracy and speed than the rear sight, the front sight (or target) is where your focus needs to be, not blocked by the ordinarily larger conventional rear sights. When traditional notch and post sights are aligned, the rear sight can actually obscure much of the target. A better design would be to have the rear sight smaller so it would cover as little target area as possible. It would also not distract the shooter's eye from either the target or the front sight. Any sight used in a self defense role must resist snagging on the draw, and fit in standard holsters. The simplest, most intuitive alignment. It's instinctive and easy to use every time. The largest, easiest-to-see front sight of any handgun sight in the entire world. Lightning quick, easy and fast sight acquisition. Exposes more of the target than conventional sights. Can be instantly aimed even with your eyes focused on a distant target. Highly visible in low light. Fits in all standard holsters. If it ever breaks, we'll replace it. ORDER SURESIGHT TODAY, AND START SHOOTING BETTER ...INSTANTLY. Currently the SureSight ST-1 is available for all models of Glocks, XDs and Sig Sauer P22x series pistols.At only $99 for the daytime sight and $129 for the tritium night sight version, you can have a handgun sight that will improve your shooting ability, and may even save your life. You risk nothing. Order yours today, and change the way you look at sights! As a law enforcement range instructor, I have found the SureSight to be an invaluable tool particularly for shooters with less than perfect eyesight. In the case of shooters wearing bifocals or with depth perception issues, the Sure Sight has virtually eliminated the need for one to assume an artificial head position to obtain an accurate sight picture. As a user of the Sure Sight, I have found it to be the first sight system that allows an immediate clear front sight picture without interference from the rear sight, resulting in noticeably more accurate shot placement. As a member of an Emergency Response Team responsible for terrorist interdiction, I am always interested in new equipment that can make me more effective at my job. I have found SureSight to be fast and easy to align in both daytime and low light conditions. They are currently in use on my daily carry Glock. I spent about two hours at the indoor range yesterday and the sights worked great. I was able to tear the head and chest out of a silhouette target. Point of aim was right on. I shot all the way to 30 yards, which was max at this range. The front sight just seems to float in mid air and when the triangle is complete and on the target I was dead on. They have helped my IDPA scores remarkably and really help these old eyes get on target.